This Q & A was presented in the Post and Courier newspaper on September 18 as a question & answer session in connection with Elie Wiesel’s speech at the College of Charleston (South Carolina) on Sunday, Sept. 25. The first picture accompanying this news story is the famous one that is permanently associated with Wiesel wherever he goes. The caption tells us that Wiesel is in the picture, but we, the followers of this blog, know that he is not and that a Gigantic Fraud has been carried out concerning this picture, by powerful forces such as the New York Times, and by Wiesel himself. Q: In your book “Night,” you describe the ardent faith you practiced as a child and address the dilemma of a compassionate God, making it clear that because of the Holocaust and what you witnessed during your ordeal, you became a skeptic. Are you still asking questions? What is the nature of your faith or nonfaith today? A: First question, yes, I continue asking questions. I belong to the Talmud tradition. The Talmudic tradition actually emphasizes the question, much more than the answer. Answers come and go, the questions are eternal. When it comes to the question of faith, of course, … profound or painful. So what I say to myself is, “Of course I believe in God.” I believe in God because my father and my grandfather and his and so forth, they all believed, and (down) the line — I hope I’m not the last. … But my faith is a wounded faith. Comment: Wiesel is proud to be Talmudic. In his tradition, answers are not expected. Perhaps answers are not even missed, for Talmudic Jews take pride and pleasure in endlessly discussing what is God among themselves. They determine God; it is not God who informs them. Wiesel says he continues to profess belief in God because he wants to honor his ancestors. It is a Jewish tradition. Q: And what about the concept of justice? Is it possible to reconcile it with the abomination that was the Holocaust? A: To me, this is the question of all questions. On many levels, I don’t understand God, which I cannot. We have a very, very great sage called Rabbi Eliezer HaKalir. He was a great, great thinker and a poet, too. And he said, “If I knew God I would be God.” So nothing concerning, really, the definitive God, the Almighty, Just, the King of the Universe is a question. I don’t know how it’s possible He knew and yet he is silent. So the silence of God troubles me. But it doesn’t stop there. The silence of the world’s leaders also troubles me. Comment: The King of the Universe, says Wiesel, is silent about the Holocaust. Could it be because it is untrue and their God doesn’t or can’t acknowledge what is false and has no reality? In any case, Wiesel would rather focus on the world and its leadership. Q: There’s sacred justice, but there’s also human justice. A: Yes. Human justice. Exactly. 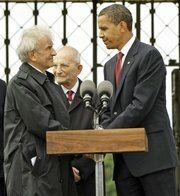 The next picture shows President Barack Obama shaking hands with Elie Wiesel, who specifically invited the U.S. president to visit the former Buchenwald camp during his trip to Germany in June 2009. Wiesel has great influence as the most famous survior of Buchenwald … but wait! He wasn’t at Buchenwald. There are no records of his being there and he is not in the famous photograph above. What kind of trick is being played on the unsuspecting President Obama? Q. And what about that? Humans are so fallible, as we know, and their justice is imperfect. Do you still think that (human) justice could ever match the depth of the injustice of the Holocaust itself? A: It comes to define justice. Justice with a capital J — absolute justice — is one question. But the justice which has, — how to say? — betrayed, perverted human beings, that’s another question. Comment: This answer doesn’t answer anything. Instead, it repeats the question–a typical Wieselian response. Another iconic photo chosen for this story is this one also taken at Buchenwald in 2009. It shows Obama and German Chancellor Angela Merkel walking with Wiesel (on the right), who is “showing them around.” I believe this is his very first visit there. But then, that’s no doubt true for all of them. Q: Has life for you continued to be a long “night”? If so, what has kept you going? What, if anything, gives you joy? A: Joy. … I see children, I have joy. I have my grandchildren, I have joy. On the other hand, I remember that we lost almost 2 million children. So the joy is not a perfect joy anymore. Comment: Apart from the fact that 2 million children were not lost, Wiesel is a millionaire, lives in one of the highest priced locations in the world, is listened to by rulers, presidents and celebrities; has hundreds of people to do his bidding. The public treats him with reverence. His beloved State of Israel has become a great power. But I guess we’re to believe he is really suffering. Q: Has there been any change, any little glimmer of light that managed to penetrate the “night”? A: The answer is yes, it must be. It must. I think it was (Albert) Camus who said when there is no happiness, you must create happiness. That goes for joy, that goes for peace, that goes for all the good things in life. To say that night has vanished, no, it’s not, it’s still there. But paradoxically, other things came afterwards, and they, too, are as real. In other words, I would still say night is long and infinite, but I’m not alone in this world. Comment: Time for the violins to start playing in the background. Q: And in a way, perhaps, your writing itself, all the books, has helped to create some semblance of happiness for you? A: Only if other people are happy and feel victorious over sadness. My happiness must be a result of theirs. Comment:The violins are still playing. Q: The Holocaust surely was an aberration, an example of Fascism run amok. But Fascism has a tendency to run amok, as you repeatedly have pointed out. You have condemned genocides and reminded the world that it must remain vigilant. How do you categorize the Holocaust? Was it unique in its nature, or only its scale? A: No, I think it was unique; therefore, it must remain unique in memory. Once you say that it’s not, it opens history again to other mass murder. History has proven that it can and, therefore, it may continue. Comment: Take notice! Wiesel is making it clear: the Jewish Holocaust was unique! His reasoning (?) is that if it were not, new genocides can happen. The Holocaust, by being unique, closes history to more mass murder. (This is perilously close to saying the Jews died so that others would not — an aspect of their hidden agenda to replace Christ with The Jew.) But he follows by saying it can, and may, continue. As he said at the beginning, there are no answers … not from God and not from him. Q: You have long been a supporter of Israel, and were once invited to consider public office there. A: (Laughing) I was offered to be a president. I was under pressure in the first few weeks, and, you know how it is, the more I said no, the harsher the pressure grew. Comment: He has a close relationship to all top Israeli politicians, from at least 1950 on. Q: So what made you decide to stay in the United States? A: I came here in 1956. I came as a stateless person. Can you imagine? You cannot, because you were born here probably. … And here I came, I was accepted by the United States as an American citizen. And I had my passport all the time with me because I never had another passport in my life. So I owe this country quite a lot. I love this country. Comment: This is an insincere answer. He could have become a citizen in any state, certainly in France even when he was underage. He didn’t want to. He wanted to be in the most powerful country, the one the Jews of Israel planned to control. This is why he came to the U.S. and devoted himself to projects like bringing into existence the United States Holocaust Memorial Museum, a huge victory for Jews. Q: Do you ever worry about the ways in which the Holocaust has defined Jewish identity since the war? A: Well, I know I read about it. Some people believe this is exaggerated — we shouldn’t do that. I don’t like to turn it into an object for discussion. … What every person does or thinks with regards to (an event), I don’t want to put myself in their soul-searching. I think memory is what defines a human being and society. If you betray memory, you betray yourself and all those who believe in it. Comment: He doesn’t answer the question. In truth, the ‘Holocaust’ has defined not just Jewish, but Anglo-American and European identity in ever-increasing strength since 1945. It is non-Jews who should be very worried about how the Big H has defined our identity, which is why Wiesel avoids the subject. Q: When it comes to Jewish identity, how important is Israel? And what do you think should be done to resolve the conflict there? A: I’m optimistic. … My foundation has created many things. My foundation is the one that brought together the prime minister of Israel (Ehud Olmert) and (Palestinian Authority) President (Mahmoud) Abbas. (Note: The historic first meeting of Olmert and Abbas took place at the Elie Wiesel Foundation’s second annual Conference of Nobel Laureates in Petra, Jordan, on June 22, 2006.) For the first time, they met under our auspices, and they met, they fell into each other’s arms with tears in their eyes. I turned to my wife, I said, “Look.” This is the best event that I witnessed in many, many years. Which means it can be done, therefore, it will be done, my feeling is within a year or two. Comment: How evasive is that? He brings up something that occurred in 2006 – 5 years ago! This is more avoidance of facing the real crisis that Jewish Israel has brought about by its constant theft in the name of establishing an ‘identity’ for itself. Weisel is a fraud of the highest order. How does this sociopath sleep at night? I’m sure he has no trouble sleeping because of his belief that Memory is the most important aspect of history. This ties in with his statement(s) that “Some things are true even if they never happened.” If I convince myself I remember it, I am not telling a lie. You see how easy it is for Talmudists? I will be writing more on this in the future as it is the secret to Jewish success. As Wiesel proves, Jews do not discuss their Holocaust. Just like the victors in a war discussing the surrender of the vanquished – the victors dictate the terms of surrender and the Jews dictate how we are to respond to their biggest lie. The Holocaust was a lie constructed by Jews? I can’t believe that a rational human being can honestly think that the arguably most horrific genocide in human history was a fabrication designed by the victims. It’s, quite frankly, disgusting. Also disgusting is the overall stereotyping of Jews that is maintained by this website and its supporters. Even if you are repulsed by Wiesel, you cannot judge the whole population of Jews by his actions. This website does not stereotype, nor judge the whole population of Jews by the actions of Elie Wiesel. I judge the whole population of Jews by their own actions. For instance, you say it is “disgusting” to believe the Holocaust could be a lie constructed by Jews. Reasoning tells us that IF the Holocaust IS a lie, the lie is the work of Jews, including yourself since you seem unwilling to look into it with an objective frame of mind. I would ask you to read one basic holocaust revisionist text, such as by Arthur Butz, Juergen Graf or Germar Rudolf, before thinking you know that questioning the truth of the Holocaust is “disgusting.” Perhaps it is a natural outcry of truth-loving souls. I would also ask you to read the entire contents of this website, or at least try to answer the question “Where is Elie’s Tattoo?” and why the Jewish community does not demand he show what he claims he has? Don’t just read or listen to what the Jews say. Listen to the other side too. Jews, except for rare exceptions, don’t do that; instead they protect one another, which is why they are not respected. First let me clarify for you: I think it is disgusting that anyone can think that th Holocaust is a lie regardless of whose lie it supposedly is. Stereotyping is defined as assuming that all of the members of a group are the same. You say that you judge the Jews based on their actions…so you know every Jew in the world and are aware of his/her actions? Wow. Oh, and excuse me for not being able to believe that there might not have been a Holocaust with all the photograps, video footage, and testimony from both survivors and soldiers who liberated concentration camp prisoners that prove it. How do you account for this? There is no “other side” to listen to, and by claiming that there is, you are being illogical, not “open-minded”. And by the way, I said nothing about the validity of Elie Wiesel; it’s actually rather irrelevant that you included him in your response. Well, I included him because this web site is about Elie Wiesel and only about Elie Wiesel. You don’t seem to want to defend Elie Wiesel, but you do believe in the whole holocaust thing despite Elie Wiesel’s lies. How many other Elie Wiesel’s are there (although without Nobel Peace Prizes)? I wonder if you know how typical it is for believers to want to only refer to the ‘Holocaust’ in general, as you’re doing, and not get into any details about individual stories or events? If I had the time to take each one of those photos, clips of video footage, and testimony and point out the problems with them, and you had to answer me … you would be at a loss. That’s why it’s always presented as an overwhelming, multi-faceted event with everything but the kitchen sink thrown at us at once. Think about that. I am currently reading the book Night by Elie Wiesel at school and we had an online discussion tonight about the first three chapters. I thought I would research a little on the side and check out more about Elie and his book. I stumbled upon this website and became a little discouraged. Throughout history man has often tried to disprove anyone who went against the norm or status quo of society. The most famous case was documented in the New Testament. Anyone who has read the New Testament without knowing God’s plan for mankind would think, WOW those damn Jews killed Jesus. But alas, those who know that God’s plan was for us to have Eternal life through Jesus Christ, know that he had to die. God used the Jews to fulfill his plan. Nowadays there are so many people who try so hard to prove that Jesus never existed. But really, were any of us there? No. Was I there during the time of World War II? No. But, that doesn’t mean it did not happen. I don’t know if Elie was there or not but that doesn’t disprove that the Holocaust happened. Let me close by quoting a scripture, “Thou shalt not bear false witness against thy neighbour.” (Exodus 20:16 KJV) God is and will be the final judge. I agree that the Holocaust is a disgusting lie created by Jews, for the Jews. However, we can’t tar ALL Jews with the Great Lie Brush. there are Jews who have spoken out against this filth. However, I believe them to be in the minority. The other interesting thing about so-called “religious” Jews, is that polls have shown that a majority do not believe in the Torah as truth, but the majority believe absolutely in the genocide of the 6 million. The word of Wiesel has replaced the word of Moses as the religion of the Jews. These people calling the Holocaust a lie are going to space Hell. It’s like Hell, except you explode from the pressure differences, and go back to space Hell and it happens again and again and again. funny how people think that the Holocaust was a lie or never happened. Funny how some of you guys think that Elie Wiesel is a liar. If he was a liar, then why would there be pictures and documents of this horrifying time period? Why are Holocaust survivors living? 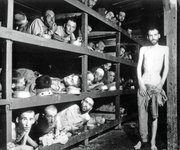 Why are the concentration camps used to torture these innocent people still standing to tell the world that the Holocaust did happen? These innocent people had suffered a lot and you guys are just saying “Oh, they’re just big fat liars”? That’s disrespectful and offending to them. I suggest you watch Schindler’s List or something so you can really see how much they suffered. I thought there would be some useful information here for my school project, but instead, I find stupidity that just pissed me off. You guys are just hilarious for creating this stupid website. I laugh at you people. Funny how you sign yourself “for me to know” rather than using your name. Aren’t you just a high school student telling the truth? Why not let your teacher know how hard you’re working? Why don’t you read the articles on this website, then you wouldn’t make the dumb statements you have and you would be able to talk about specifics. You are pretty laughable yourself. The ambiguity circling around Elie Wiesel’s identity is new to me. Today I read the article in a Hungarian newspaper, ‘Nepszabadsag’ that Elie Wiesel’s identity will be discussed in court in January 2012, in Budapest. According to the article, Miklos Gruner, the Auschwitz survivor had been housed in the same barrack with Lazar Wiesel, ID# A-2213. But neither Gruner, nor Elie Wiesel recognized each other during their 1986 meeting in Sweden. The Swedish TV organized that meeting. This could not happen between Holocaust survivors. Each day and action in a concentration camp had to be ingrained of the prisoners’ mind of such scale of humiliation and horror. I read several books of Elie Wiesel and encouraged my children to read his books. Elie Wiesel’s books are literary gems, but covering up his actual identity is a historical, ideological, and political identity problem. I never doubted the existence of the Holocaust. I grew up in Hungary where we studied and read extensively about the Holocaust. (Compared to German education, the Holocaust has never been taught to at least to two generations. I lived in Germany.) However, the explanation and interpretation of the Holocaust is a 400 years issue, connected to colonization. The Jewish people and then individual identity–the only people whose religion and race are the same–has been used for ideological purposes during colonization. The Manifest Destiny of the 19th century, God’s chosen people will go ahead and prevail over any obstacle, stems in this same idea, though altered. The Holocaust did exist in the 20th century, but many other holocausts, genocides, have taken place in the colonized new lands and are still taking place in Africa–Cote d’Ivoire, Rwanda and other colonized countries. If Elie Wiesel’s identity will be proven forged, then many identities and ideologies and political conflicts will become more apparent. Our responsibility is to find the causes of the Holocaust, not to deny it, and connect the ideologies to be able to bring back the cultures, nations and states into balance. Throw mud at each other on this page is the waste of time. Following the court case, however, will be very educational. My daughter attends the College of Charleston in South Carolina, and Elie Wiesel was a guest speaker during ‘Parents Week’ at the college. I urged my daughter to attend the event, but the tickets had been sold out. Interestingly, the South Carolinian coast, the Lowcountry, is the land where the internal slave trade was established. That Elie Wiesel appeared in that meeting shows an advanced, cosmopolitan idea that education about the Holocaust is reaching this state, or perhaps reinforced for some reason. South Carolina is 49th in US education, and the ‘establishment or good ol’ boys, still rule the politics, economy, and education in this state. Instead of degradation, there is a lot of history, religious ideas, politics to be learned. I didn’t finish the sentence: The January hearing starts on the 24th. More correction: Lazar Wiesel’s Auschwitz ID# is A-7713. The conflict is that Lazar Wiesel wrote his authentic story in 1957, that Eli Wiesel might have ‘borrowed’ from him in his later stories. You should read The Shadowy Origins of Night, all three parts. http://www.eliewieseltattoo.com/the-shadowy-origins-of-night There is much you don’t know, and you will be enlightened by it, and other articles on this site. Thanks for alerting us to the court date. Thank you for your comment and the website. The discrepancies mentioned among the writing processes and the disappearance of the original manuscript are illogical. Though “Lazar Eliezer Wiesel”‘s (ELW) explanations fit the writer’s individualistic right of explanation. But this is Miklos Gruner’s greatest dilemma, how to prove Elie Wiesel’s false identity, when the whole world accepted ELW, the Jewish literary genius with some institutional help, as ELW the Holocaust survivor? Yes, there is much to learn about the 20th century European and world history, but I cannot even imagine to delve into this hot issue. The Jewish people became the untouchable symbolic identity of victims of humanity after the Holocaust. So, Elie Wiesel inherited the hatred against the Hungarians, since he was born in 1923, after WWI. This problem is complex and unknown to many people. Most Americans don’t want to know about the actual European history. Good luck with the research and I’ll follow the case in Hungarian and perhaps in English, if it reaches the news. Thanks for this information too. Elie was born in 1928, according to him, not 1923. Small error. He grew up caring only about Jews, studying the Talmud and trying to study the Cabbala. According to him, he knew nothing and cared even less about non-Jews. In all his long life, that has not changed. As a member of the Orthodox Hasidic sect, he remains fanatically Jewish and Zionist. what are two examples of individualism in your book “Night”? You know what is even more disgusting? That you people think he is a fraud because he won&apos;t show you his numbers. This guy went through something horrific and you won&apos;t give him respect because he won&apos;t show you something that dehumanizes him. Have you actually thought about the truths out weighing the lies? Instead you manipulate people with your little side comments that don&apos;t even give Elie&apos;s true thoughts. If you were only called by numbers and not your God given name (for lets say two years? ), would you feel proud of showing people something that made you feel below human, like an animal essentially? Then add starvation,abuse,illness,and disgusting living conditions to that equation. Just use empathy before you accuse somebody, and keep you little side comments to yourself, because it&apos;s not worth dehumanizing someone (again) because you don&apos;t believe that his answers are everything you want to hear or because he won&apos;t show you numbers etched into his skin that he had to hide behind for so long. The human mind is only capable of so much, and Elie is so brave for even telling his story. Please reconsider what you are doing, and base your accusations on a little more proof.